© 2017 Sandhu et al. Systemic Lupus Erythematosus (SLE) is an incurable autoimmune disorder with complement activation playing a key role in the pathogenesis of immune-mediated tissue injury. While quantifying complement to monitor SLE disease activity has been the standard of care since the 1950s, decreased complement levels are not consistently associated with flares. We seek to clarify the SLE phenotype in which complement deficiency is causative, concomitant, or coincidental. A PUBMED literature review was conducted using key words 'complement,' 'SLE,’ and ‘SLE flares’ in English-only journals from 1972-2017. Relevant clinical studies and review articles were found that examined the measurement of complement levels in SLE, and more specifically, interpretation of low serum complement levels regardless of disease activity. Complement activation plays a key role in the pathophysiology of SLE and it is recommended to continue monitoring serum levels of C3 and C4 to assess for disease activity. However, it is important to note that decreased serum complement is not consistently associated with disease flares. It is clinically important to find novel ways to assess disease activity in SLE. Increased serum levels of cell-bound complement activation products may more accurately reflect disease activity than conventional serum C3 and C4 monitoring. Keywords: SLE, Systemic Lupus Erythematosus, SLE flares', Complement, CB-CAPS. Systemic Lupus Erythematosus (SLE) is a heterogeneous incurable autoimmune disorder characterized by both B- and T-cell dysfunction that results in immune-mediated multi-system tissue damage. The associations of SLE with end-organ damage, its disproportionate involvement of young females and greater disease burden and severity in minority populations  emphasize the importance of timely diagnosis and intervention. The current diagnosis of SLE relies on a combination of history and physical examination findings as well as laboratory criteria . Because of the heterogeneity of the disease and less than ideal sensitivity and specificity of immunologic testing, diagnosing individuals with SLE and then monitoring their disease activity have proven to be difficult. While standard laboratory testing for SLE includes antinuclear antibody (ANA) and anti-double-stranded DNA (anti-dsDNA)  among other autoantibodies, complement activation has proven pivotal in the pathogenesis of SLE-related immune complex damage  Fig. (1). For years, serum complement proteins, C3 and C4 specifically, have been used to gauge SLE disease activity (SLEDAI); so much so that recent recommendations have included reduced serum complement levels (C3, C4, CH50) in the classification criteria of SLE . However, a confounding factor often encountered in monitoring serum complement levels to ascertain SLE disease activity lies within the subset of SLE patients with a primary complement deficiency. In this subset of patients, who may be asymptomatic, complement levels may indefinitely be low and thus result in misinterpretation of laboratory testing. To this effect, ongoing biomarker research has now also implicated monitoring cell-bound complement activation products (CB-CAPS) in place of serum complements with greater sensitivity in SLE diagnosis [5, 6]. In the present study, we seek to clarify the SLE phenotype in which complement deficiency is causative, concomitant, or coincidental to guide clinicians in providing timely and appropriate management. Fig. (1). 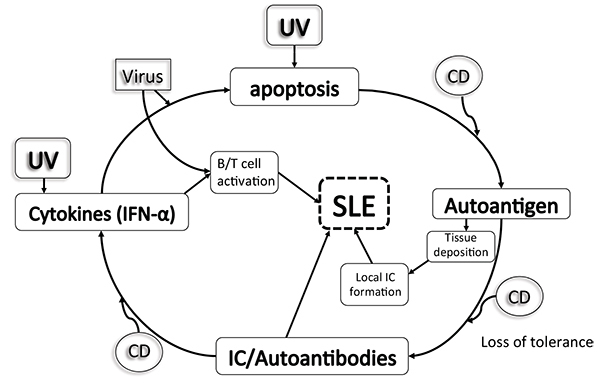 Suggested roles for complement in the pathogenesis of SLE. Complement dysfunction (CD) is proposed to accelerate several steps in the pathogenic pathways. Ultraviolet (UV) light and viral infection are examples of environmental influence. IC, immune complex. We conducted a PUBMED literature review using key words ‘complement,’ ‘SLE,’ and ‘SLE flares in English only journals from 1972-2017. Relevant clinical studies and review articles were found that examined the measurement of serum complement levels in SLE. Of particular interest was the interpretation of low complement levels in patients irrespective of their individual disease activity. The complement system is a complex pathway in the immune system composed of proteins and receptors that improve the ability of antibodies and phagocytes to remove microbes and damaged cells from an organism. In addition to its function in combating infectious diseases, it also plays a key role in the inflammatory response prompted by immune complex deposition in numerous autoimmune diseases, including SLE. 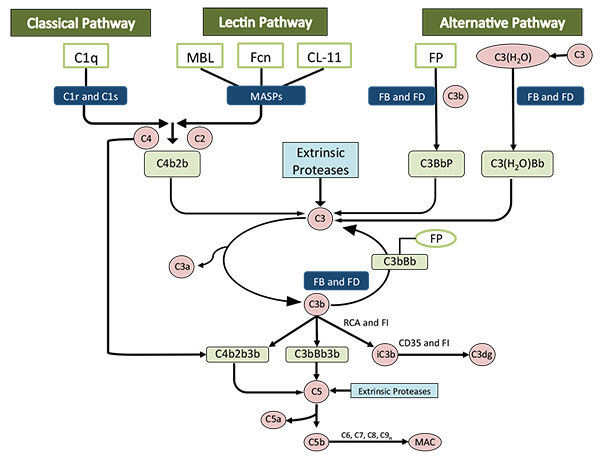 Most complement proteins circulate in an inactive form and can be activated by three pathways: the classical pathway, the alternative pathway and the lectin pathway Fig. (2). Regardless of the pathway, cleavage of C3 and C5 ultimately occurs, producing C3a and C5a anaphylatoxins, C3b opsonins, and C5b for the creation of the membrane attack complex (MAC), which comprises fragments of C3b, iC3b and C3d that act as a bridge to phagocytic cells. There is also the production of chemotactic factors, inflammatory modulators [7-9] and antibody production, whereby antigens bind to C3d, which interacts with complement receptors and B cell receptors on B-type lymphocytes that activate, proliferate and produce antibodies . The complement pathway then assists in clearance of immune complexes and cell lysis via the membrane attack complex and removal of apoptotic cells and debris via C1q, C4b and C3b, which enhance the ingestion of dead cells by phagocytes [11-13]. Numerous studies have demonstrated a decrease in complement proteins in patients with active SLE, for which quantifying complements have become a standard of care since the 1950s [14-16]. Inherited deficiencies of the complement system, however, demonstrate an independent predisposition of affected individuals to bacterial infections and SLE [17-19]. Complement deficiencies are said to comprise between 1 and 10% of all primary immune deficiencies , with an increased association of early complement pathway deficiencies (C1q, C2, C4) in autoimmune diseases [20, 21] like SLE and deficiencies in late complement pathway components (C5-C9) associated with infections, particularly pneumococcal, influenza, and Neisseria infections . It is the loss of self-tolerance that results in autoantibody production in SLE patients with impaired clearance of apoptotic debris. C1q and other proteins typically assist in the removal of apoptotic material, which may explain why C1q deficiency has specifically been associated with impaired immune complex and apoptotic cell clearance . Anti-C1q antibodies also bear a direct association with renal involvement in SLE and potential predilection for renal flares. The central pathway for complement activation in SLE is the classical pathway when activated by immune complexes, which present decreased serum levels of C1q (90-93%), C1r/s (50-57%), C4 (75%), and C2 (10%) (14-17). A more recent review of C1q-deficient patients identified the SLE phenotype to include discoid rash, oral ulcers and anti-smith antibodies with an unusually negative anti-dsDNA and less frequent arthritis [24, 25], implicating potential utility in screening dsDNA-negative cutaneous lupus with serum C1q levels. While C3 may also be low in SLE, its levels tend to remain normal due to the inhibition of classical pathway activation by C4 binding protein . Low levels of C3 are usually associated with low levels of Factor B, indicating an increased C3 turnover through involvement of the alternative pathway [27, 28]. 1. The disease is in remission and patient is C4A-deficient (i.e. lacks expressed C4A alleles) such that the patient will indefinitely have a low serum C4. 2. There is ongoing classical pathway activation due to active disease (it is important in this scenario to repeat C4 to ensure that the levels are, in fact, low and not due to lab error). As noted, the interpretation of a low serum C4 in a patient with SLE can be complex because reduced levels may be due to the complement consumption or deficiency of one or more alleles or even both scenarios in one patient. In addition, while inherited deficiencies of the complement system are characterized by the static absence of a single complement component, in consumption (as in SLE), there is a fluctuation over time and a decrease in multiple components of complement i.e. low C2, C3, and C4. In the face of uncertainty, a blood sample may be sent to a commercial laboratory specializing in complement tests. To determine the number of C4 alleles at the DNA level, the sample would need to be sent to a research laboratory where HLA typing can determine if the patient carries the HLA-B8, DR3 haplotype. Definitive reviews have been published on determining the number of C4 genes in a large number of normal controls and SLE patients [34-36]. The total hemolytic complement (THC or CH50) assesses the ability of serum to lyse sheep red blood cells sensitized with rabbit immunoglobulin M antibody. All components of the classical pathway are required to give a normal CH50, which makes it a useful tool for detecting a deficiency of the classical pathway. It does not assess the alternative pathway because factors B, D, and properdin are not required for the classical pathway. A very low or zero CH50 can result from a genetic deficiency of one or more complement proteins. Moderate reductions in CH50 are often seen in pathologic processes secondary to immune complex formation . 1. Variations in complement protein levels due to the individual genetic polymorphisms. 2. Production and breakdown of complement proteins vary with SLE disease activity and individual synthesis response variability. C3 and C4 are also acute phase reactants, implicating an increased synthesis rate in response to inflammatory stimuli. Similarly, this increased synthesis rate may compensate for the increased breakdown demonstrated in SLE due to complement activation . 3. Serum complement levels may vary when compared to the tissue levels as demonstrated previously with glomerular basement membrane deposition of complement [40, 41]. 4. Autoantibodies to C1q may activate complement in vivo and activate the complement system regardless of disease activity. Additional studies measuring complement activation products allow for a different, albeit controversial, approach to monitoring SLE disease activity. Elevated levels suggest that SLE (or other diseases in question) is active, while low levels imply that consumption is greater than synthesis . While this is older literature, a functional assay was suggested at the time for all patients with SLE. Unfortunately, direct measurement of complement activation products is not routinely available, is short-lived and may also be affected by activation during the procurement and freeze thawing. Recent data, however, has identified serum cell-bound complement activation products (CB-CAPS) with half-lives as long as the hematopoietic cells with which C3d and C4d (erythrocytes EC4d, B-type lymphocytes BC4d) are bound . These CB-CAPS are identified in most patients with SLE and have demonstrated greater sensitivity and specificity compared to the use of low serum complements for the diagnosis of SLE [6, 44]. Similar studies have demonstrated that elevated levels of complement split products, particularly those of the alternative and terminal pathway activation, may more accurately reflect disease activity than conventional monitoring of complement C3 and C4 in predicting an impending SLE flare [41, 45]. More studies are indicated to clarify this concept and are ongoing with CB-CAPS demonstrated to be quite specific (80-90%) for and present even in mild SLE [43, 44]. The Avise Lupus test was developed in response to the limitations of current diagnostic tests for SLE . It incorporates objective measurement of CB-CAPs and autoantibodies associated with connective tissue diseases. Validation studies have demonstrated that the test has high sensitivity and specificity, and even higher sensitivity than the American College of Rheumatology (ACR) score . This supports earlier findings that CB-CAPs are valuable biomarkers of SLE and that the Avise Lupus test can be an effective supplement in the diagnosis of SLE when clinical and immunological features of SLE are insufficient [46, 47]. The SLE classification criteria was initially set forth in 1982  by the ACR, which was revised in 1997 [49-52]. The Systemic Lupus Collaborating Clinics (SLICC) cohort published a new set of validated criteria in 2012, to include at least one clinical and one immunological criterion in 4 of 17 criteria (Table 1). One of these criteria includes low serum complement levels of C3, C4 and total complement (CH50), signifying the vital role of complement in SLE. Testing complement levels has been a standard component of laboratory evaluation to help assess disease activity when monitoring patients with SLE. Low complement levels often signify active lupus, especially lupus nephritis. However, it is difficult to ascertain whether low complement levels are due to consumption during inflammation or due to an inherent deficiency of one or more alleles. Even more obfuscating, the two scenarios may exist in one individual. Table 1. Classification criteria for systemic lupus erythematosus. ACR: American College of Rheumatology; SLICC: Systemic Lupus International Collaborating Clinics; SLE: systemic lupus erythematosus; ECG: electrocardiogram; ANA: antinuclear antibodies; Anti-Sm: anti-Smith antibody; IgG: immunoglobulin G; IgM: immunoglobulin M; Anti-dsDNA: anti-double-stranded DNA; ELISA: enzyme-linked immunosorbent assay; IgA: immunoglobulin A. * For the ACR criteria, no distinction is made between clinical and immunologic criteria in determining whether the required number has been met. The classification is based upon 11 criteria. For the purpose of identifying patients in clinical studies, a person is said to have SLE if any 4 or more of the 11 criteria are present, serially or simultaneously, during any interval of observation. ¶ For the SLICC criteria, criteria are cumulative and need not be presently concurrently. A patient is classified as having SLE if he or she satisfies four of the clinical and immunologic criteria used in the SLICC classification criteria, including at least one clinical criterion and one immunologic criterion. Δ Alternatively, according to the SLICC criteria, a patient is classified as having SLE if he or she has biopsy-proven nephritis compatible with SLE in the presence of ANAs or anti-dsDNA antibodies. Complement activation is an important component of SLE pathogenesis and it is still recommended to continue monitoring serum levels of C3 and C4 to assess for disease activity. However, decreased complement levels are not consistently associated with disease flares, and the disadvantages of measuring complement levels include variations in genetic polymorphisms, synthesis variability and autoantibodies that may activate complement in vivo irrespective of disease activity. It is clinically important to find novel ways to assess disease activity in SLE. With recent studies demonstrating that increased levels of serum cell-bound complement activation products may more accurately reflect disease activity than conventional complement C3 and C4 monitoring, we believe that this is an important area for future SLE research and look forward to further studies on research in the complement in SLE. Danchenko N, Satia JA, Anthony MS. Epidemiology of systemic lupus erythematosus: A comparison of worldwide disease burden. Lupus 2006; 15(5): 308-18. Egner W. The use of laboratory tests in the diagnosis of SLE. J Clin Pathol 2000; 53(6): 424-32. Manderson AP, Botto M, Walport MJ. The role of complement in the development of systemic lupus erythematosus. Annu Rev Immunol 2004; 22: 431-56. Coulthard LG, Woodruff TM. Is the complement activation product C3a a proinflammatory molecule? Re-evaluating the evidence and the myth. J Immunol 2015; 194(8): 3542-8. Da Silva WD, Eisele JW, Lepow IH. Complement as a mediator of inflammation. 3. Purification of the activity with anaphylatoxin properties generated by interaction of the first four components of complement and its identification as a cleavage product of C’3. J Exp Med 1967; 126(6): 1027-48. Osler AG, Randall HG, Hill BM, Ovary Z. Studies on the mechanism of hypersensitivity phenomena. III. The participation of complement in the formation of anaphylatoxin. J Exp Med 1959; 110(2): 311-39. Dempsey PW, Allison ME, Akkaraju S, Goodnow CC, Fearon DT. C3d of complement as a molecular adjuvant: Bridging innate and acquired immunity. Science 1996; 271(5247): 348-50. Korb LC, Ahearn JM. C1q binds directly and specifically to surface blebs of apoptotic human keratinocytes: complement deficiency and systemic lupus erythematosus revisited. J Immunol 1997; 158(10): 4525-8. Taylor PR, Carugati A, Fadok VA, et al. A hierarchical role for classical pathway complement proteins in the clearance of apoptotic cells in vivo. J Exp Med 2000; 192(3): 359-66. Navratil JS, Korb LC, Ahearn JM. Systemic lupus erythematosus and complement deficiency: Clues to a novel role for the classical complement pathway in the maintenance of immune tolerance. Immunopharmacology 1999; 42(1-3): 47-52. Botto M, Kirschfink M, Macor P, Pickering MC, Würzner R, Tedesco F. Complement in human diseases: Lessons from complement deficiencies. Mol Immunol 2009; 46(14): 2774-83. Grumach AS, Kirschfink M. Are complement deficiencies really rare? Overview on prevalence, clinical importance and modern diagnostic approach. Mol Immunol 2014; 61(2): 110-7. Pettigrew HD, Teuber SS, Gershwin ME. Clinical significance of complement deficiencies. Annals of the New York academy of science 2009; 108. Bryan AR, Wu EY. Complement deficiencies in systemic lupus erythematosus. Curr Allergy Asthma Rep 2014; 14(7): 448. Figueroa JE, Densen P. Infectious diseases associated with complement deficiencies. Clin Microbiol Rev 1991; 4(3): 359-95. Elliott JA Jr, Mathieson DR. Complement in disseminated (systemic) lupus erythematosus. AMA Arch Derm Syphilol 1953; 68(2): 119-28. Schur PH. Complement testing in the diagnosis of immune and autoimmune diseases. Am J Clin Pathol 1977; 68(5)(Suppl. ): 647-59. Perrin LH, Lambert PH, Miescher PA. Complement breakdown products in plasma from patients with systemic lupus erythematosus and patients with membranoproliferative or other glomerulonephritis. J Clin Invest 1975; 56(1): 165-76. Morrow WJ, Williams DJ, Ferec C, et al. The use of C3d as a means of monitoring clinical activity in systemic lupus erythematosus and rheumatoid arthritis. Ann Rheum Dis 1983; 42(6): 668-71. Roumenina LT, Sène D, Radanova M, et al. Functional complement C1q abnormality leads to impaired immune complexes and apoptotic cell clearance. J Immunol 2011; 187(8): 4369-73. Marto M, Bertolaccini ML, Calabuig E, Hughes GRV, Khamashta MA. Anti-C1q antibodies in nephritis: Correlation between titres and renal disease activity and positive predictive value in systemic lupus erythematosus. Ann Rehum Dis 2005; 64(3): 444-8. Stegert M, Bock M, Trendelenburg M. Clinical presentation of human C1q deficiency: How much of a lupus?. Mol Immunol 2015; 67(1): 3-11. Daha MR, Hazevoet HM, Hermans J, Van Es LA, Cats A. Relative importance of C4 binding protein in the modulation of the classical pathway C3 convertase in patients with systemic lupus erythematosus. Clin Exp Immunol 1983; 54(1): 248-52. Perrin LH, Lambert PH, Nydegger UE, Miescher PA. Quantitation of C3PA (properdin factor B) and other complement components in diseases associated with a low C3 level. Clin Immunol Immunopathol 1973; 2(1): 16-27. Mayes JT, Schreiber RD, Cooper NR. Development and application of an enzyme-linked immunosorbent assay for the quantitation of alternative complement pathway activation in human serum. J Clin Invest 1984; 73(1): 160-70. Law SK, Dodds AW, Porter RR. A comparison of the properties of two classes, C4A and C4B, of the human complement component C4. EMBO J 1984; 3(8): 1819-23. Wu YL, Hauptmann G, Viguier M, Yu CY. Molecular basis of complete complement C4 deficiency in two North-African families with systemic lupus erythematosus. Genes Immun 2009; 10(5): 433-45. Yang Y, Chung EK, Zhou B, et al. The intricate role of complement component C4 in human systemic lupus erythematosus. Curr Dir Autoimmun 2004; 7: 98-132. Pickering MC, Botto M, Taylor PR, Lachmann PJ, Walport MJ. Systemic lupus erythematosus, complement deficiency, and apoptosis. Adv Immunol 2000; 76: 227-324. Fernando MM, Stevens CR, Walsh EC, et al. Defining the role of the MHC in autoimmunity: A review and pooled analysis. PLoS Genet 2008; 4(4): e1000024. Wu YL, Yang Y, Chung EK, et al. Phenotypes, genotypes and disease susceptibility associated with gene copy number variations: Complement C4 CNVs in European American healthy subjects and those with systemic lupus erythematosus. Cytogenet Genome Res 2008; 123(1-4): 131-41. Wouters D, Van Schouwenburg P, Van Der Horst A, et al. High-throughput analysis of the C4 polymorphism by a combination of MLPA and isotype-specific ELISA’s. Mol Immunol 2009; 46(4): 592-600. Margery-Muir AA, Wetherall JD, Castley AS, et al. Establishment of gene copy number-specific normal ranges for serum C4 and its utility for interpretation in patients with chronically low serum C4 concentrations. Arthritis Rheumatol 2014; 66(9): 2512-20. Tsukamoto H, Horiuchi T. [Clinical aspects of the complement system]. Rinsho Byori 2006; 54(7): 757-62. Ho A, Barr SG, Magder LS, Petri M. A decrease in complement is associated with increased renal and hematologic activity in patients with systemic lupus erythematosus. Arthritis Rheum 2001; 44(10): 2350-7. Sturfelt G, Sjöholm AG. Complement components, complement activation, and acute phase response in systemic lupus erythematosus. Int Arch Allergy Appl Immunol 1984; 75(1): 75-83. Couser WG. Glomerulonephritis. Lancet 1999; 353(9163): 1509-15. Cavallo T. Membranous nephropathy. Insights from Heymann nephritis. Am J Pathol 1994; 144(4): 651-8. Walport MJ. Complement and systemic lupus erythematosus. Arthritis Res 2002; 4(Suppl. 3): S279-93. Buyon JP, Tamerius J, Belmont HM, Abramson SB. Assessment of disease activity and impending flare in patients with systemic lupus erythematosus. Comparison of the use of complement split products and conventional measurements of complement. Arthritis Rheum 1992; 35(9): 1028-37. Mossell J, Goldman JA, Barken D, Alexander RV. The avise lupus test and cell-bound complement activation products aid the diagnosis of systemic lupus erythematosus. Open Rheumatol J 2016; 10: 71-80. Sturfelt G, Truedsson L. Complement and its breakdown products in SLE. Rheumatology (Oxford) 2005; 44(10): 1227-32. Ricklin D, Reis ES, Lambris JD. Complement in disease: A defence system turning offensive. Nat Rev Nephrol 2016; 12(7): 383-401.